When was the last time you saw a Hollywood movie which had the lead actor as the savior of humanity? I am sure the answer would be “pretty much every other movie”, isn’t it? Now, when was the last time you saw the same thing in a Bollywood movie? To make it interesting, did you ever see a full fledged ad movie in India? This is where Ching’s Secret makes the Bollywood entry (whistle !!!!!). Ching’s Secret is a brand from the house of Capital Foods . Ching’s was launched in 1996 and over the years it has witnessed moderate growth until 2 years back when the brand started witnessing a steep rise in sales. Ching’s Secret is a perfect example of having right celebrity brand ambassador. It’s a perfect mixture of leveraging the celebrity’s success with the right offering. Ajay Gupta (MD – Capital Goods) feels Ranveer Singh is the right face for the brand as the brand is targeted at today’s youth and young housewives, actor Ranveer Singh is the ideal youth icon who has pan-Indian appeal across all age groups. Related post Can Movies be termed as BRANDS? Recently, Chings’ Secret released an ad film. It’s not just an ad film, it a typical Bollywood masala movie . With the release of the ad movie Ranveer Singh took the social media by storm. The ad movie is termed as India’s first “Advertiser Funded Movie”. The movie also stars Tamannaah Bhatia and is directed by one of Bolywood’s most succesful director Rohit Shetty. The advertising budget for the adverstiser funded movie (AFM) is 75 crore ($11 million) which is usually a budget for a big star cast movie in Bollywood. 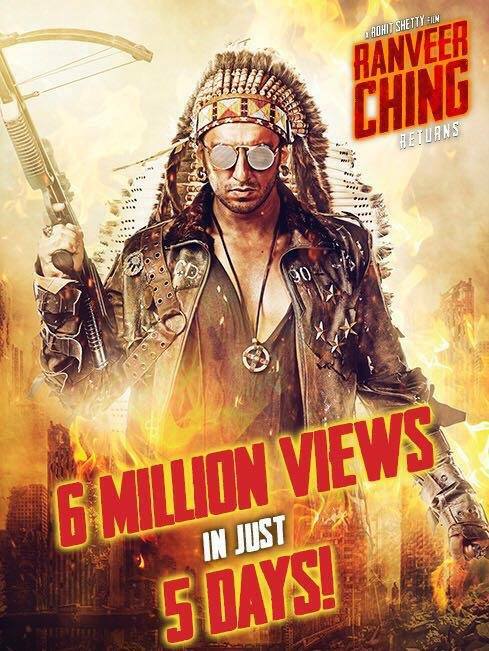 ‘Ranveer Ching Returns’ was released on YouTube on Friday (like most releases in Bollywood), August 19. 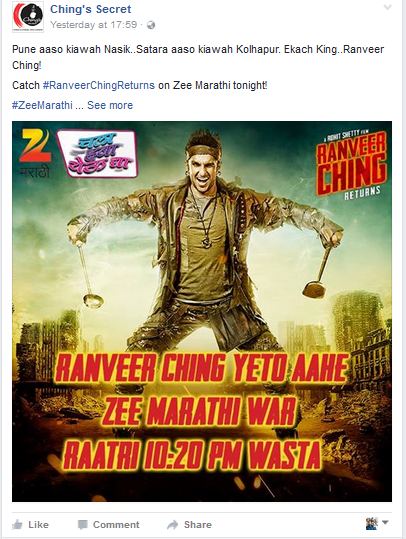 On Sunday, August 28, there was a world television premiere on Sony Entertainment Television. One the release day, the movie gained 3.5 million views on YouTube. At this very moment, the views have surged to 9 million. The brand is leveraging all the right hype on social media. Currently, Ching’s Secret has aprroximately 1 million likes on its facebook page. The brand has been very engaging with its new campaign on its sleeves. It will be interestimg to watch how the brand is able to reap benefits from this big budget AFM and its impact on sales.